*Double Sling or Double Sling Back Carry was formerly called Double Rebozo. What’s the difference between RRR, HJBC, and DS? When you get to know some wrap carries you start to recognize the same passes are used in different combinations to make different carries and offer different support and weight distribution. Some of the most common passes are Cross Pass, Traditional Sling Pass, Horizontal Pass and Rucksack Pass. Reinforced Rear Rucksack (RRR) uses a Rucksack Pass followed by a Horizontal Pass (or Torso Pass). Half Jordan’s Back Carry (HJBC) uses a Traditional Sling Pass followed by a Cross Pass. Double Sling (DS) uses two Traditional Sling Passes. Short Back Cross Carry (SBCC) could also be included in this list, using two cross passes. Because two cross passes alone may not be safe for all babies or children, I am leaving this one out of my instructions. Double Sling is so named because there are two Traditional Sling Passes over your baby. A well done Sling Pass is great for holding your baby very close and preventing any possibility of leaning back so your carry will stay comfortable for the duration. With Double Sling, there are no passes going between your little one’s legs so it’s important to pull the bottom fabric of each pass down to form a wide seat under your baby and pull any slack up to baby’s knees and tighten the rail (edge) along the knees well to hold them higher than baby’s bottom. View the full photo tutorial for Double Sling Carry here. A full Jordan’s Back Carry is composed of three passes: rebozo pass, cross pass, horizontal pass. The shorter variation known as Half JBC has just two passes: sling pass and cross pass. Because a Traditional Sling Pass is great for keeping babies and kids from leaning back, and a Cross Pass is perfect for keeping a good seat under baby if yours likes to try to straighten his or her legs and pop the seat, HJBC is a very effective wiggle-proof carry. 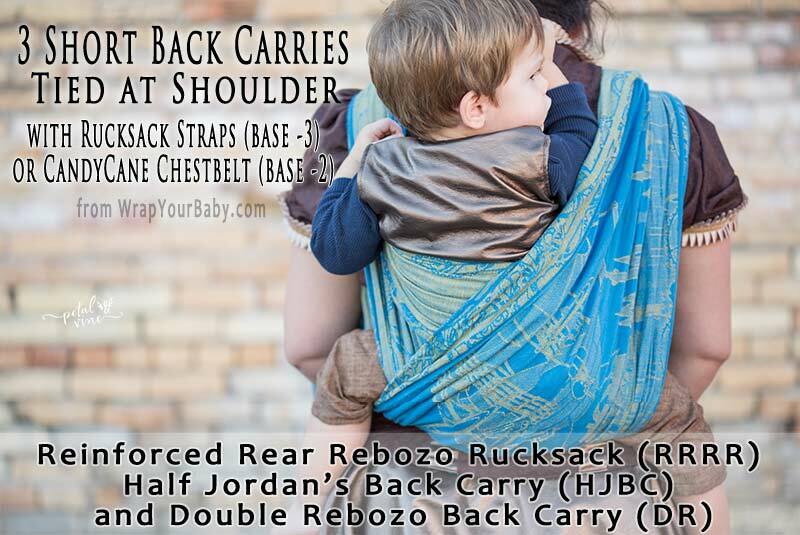 Half Jordan’s Back Carry is exactly like Double Sling Back Carry, but the second pass coming over your shoulder goes between baby’s legs, spreading wide from knee to knee, and then around your side to tie in front. If you have any trouble making or keeping a good seat with Double Sling, try HJBC instead. RRR uses a Rucksack Pass followed by a Horizontal (Torso) Pass. The Rucksack Pass, when done well with a properly tightened top rail (edge) will prevent your little one from being able to lean back in the carry. The Horizontal Pass adds an extra layer for support.